Photo courtesy of Museum in a Box. This post was written by Abigail Espiritu, 2018 Smithsonian Libraries summer intern focusing on social media and the libraries’ blog, and a rising sophomore at the University of Maryland. 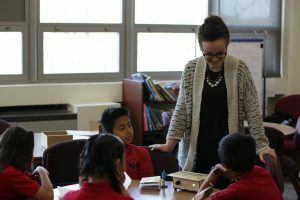 Museum in a Box (MiaB) is the newest project that is allowing the Smithsonian Libraries to bring their artifacts and images into the hands of young students all around the nation. MiaB allows students to learn about the collections from the Smithsonian Libraries and Museums, from the comfort of their own classrooms. So what is MiaB? 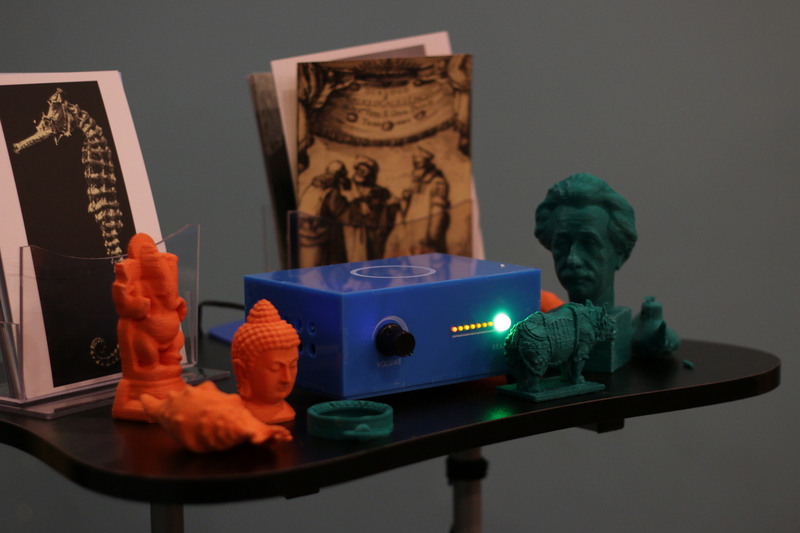 Well, actual artifacts from the Libraries are digitized into small, hand-held sized 3D versions and put into a kit. Not only that, but postcard prints are included as well. 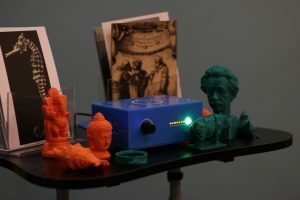 The kit comes with a small box, and when one of the objects or cards are placed on top of the box, a story automatically comes out of a speakers explaining its history. Pretty cool right? MiaB simulates an actual experience at the Smithsonian Libraries. This allows schools that may not be able to travel to the Smithsonian to rent the kit for a short amount of time for their students. The creators of MiaB are a small team based in London and Liverpool, England, comprised of CEO, Founder and Product lead George Oates, Technical lead Adrian McEwen, and Designer Charlie Cattel-Killick. In April, the three hand delivered 11 boxes commissioned by the Smithsonian Libraries. MiaB is one part of the Unstacked resource, a collection of educational tools from Smithsonian Libraries. The hands-on experience is a tactile realization of the Libraries’ Unstacked digital collections, which are housed on the Smithsonian’s Learning Lab. We spoke to Sara Cardello, our Education Specialist, who has been leading the project and she had much to say about the great potential of MiaB as an Unstacked resource and how she hopes for the project and its distribution to expand. She says that she hopes MiaB can become a more useful classroom tool that can take learning off the screen. The team behind the project wants to continue expanding into not only more classrooms, but public libraries and after-school activities as well, and making the tool relevant and useful. A more long-term goal with MiaB is to create the opportunity for boxes to be user-designed, where users can create their own content and record their own voices into the boxes. The goal with this partnership is to not only to expand geographically, but also make the product more immersive where the kids are actually creating content as well. Sara Cardello and students try out Museum in a Box. Photo courtesy of Museum in a Box. I LOVE MiaB!!!! I am from a village in Louisiana. Our school is a pre-K -12th grade school with 260 students. We have only one class for each grade level. The MiaB is a fascinating program that will allow children the adventure of a museum while never leaving our village. We are soooo far from the Smithsonian. I hope we can make this work, so our children will be able to experience MiaB. Please contact me as soon as possible. Thank you for this amazing opportunity! I am involved with a Friends of Library group and would like more information on ‘how’ to sign up for MiaB? The Friends would sponsor this experience for our community public school. This sounds fascinating and I would love to incorporate the MiaB into library programming. I would love to learn more.